Per S.B. - Coffee table of wood (walnut?) inlaid with stoneware tiles. 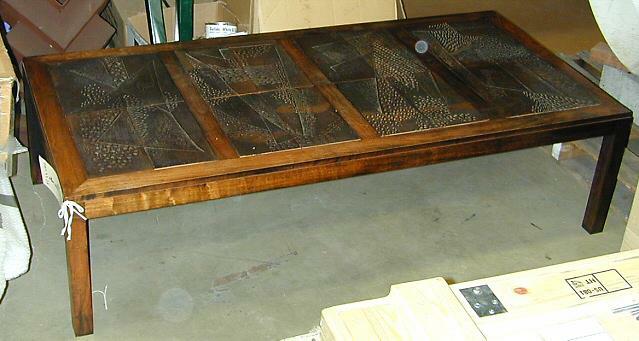 Table is low and has four parallel rectangular openings into each of which a set of four tiles have been placed. Each of the four sets is unique, patterned with inscribed angular lines and tool made texturing marks, the four individual tiles treated as one large tile. A brown glaze has been used with all tiles, with color variation produced in the firing process.